Last weekend as many gathered with their loved ones to give thanks, the Grimmond family were remembering a Thanksgiving Weekend six years ago when they were told the devastating news that their beloved daughter and sister, Carol Grimmond, had been killed by an impaired driver. Carol’s Mom, Gladys asked us and others to share their story and news of the important MADD campaign the family is participating in. Please feel free to pass this on. Carol and her twin brother were on their way home from their grandfather’s 99th birthday party when they were struck by an impaired driver going the wrong way on a divided highway. 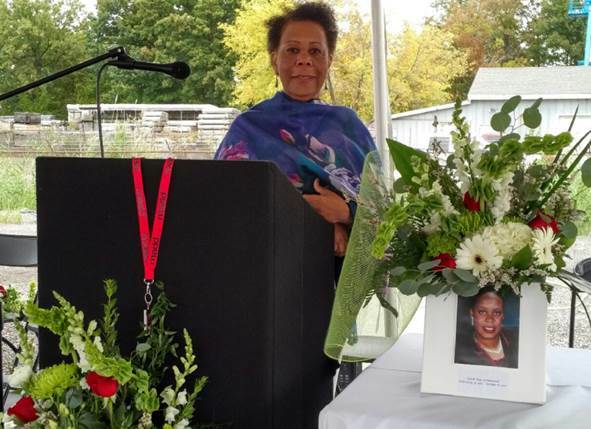 Carol was an extremely compassionate and loving woman who was committed to making a difference within her family, community and with those she worked with as a Field Intelligence Officer at the Ministry of Community Support and Correctional Services. The Grimmond family was pleased to have Patrick Brown and his team represent them and obtain some civil justice for the loss of their daughter and loving sister, Carol. 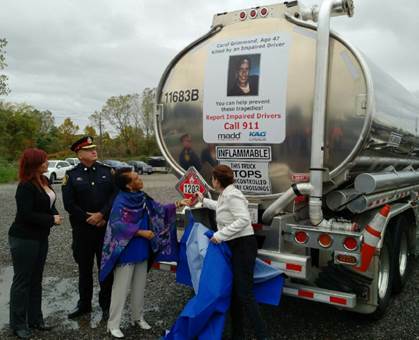 Not only have the Grimmond family fought for civil justice, but this family has taken strides with MADD Canada to ensure Carol’s memory is not forgotten and that the real and personal devastation of impaired driving is not forgotten on our roads. 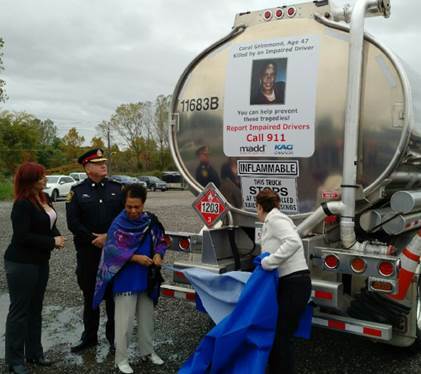 On October 4, 2018, as the sixth anniversary of Carol’s death approached, her family attended the Sarnia trucking yard of RTL-Westcan, a bulk transportation company, who has teamed up with MADD Canada to launch a new mobile awareness campaign. 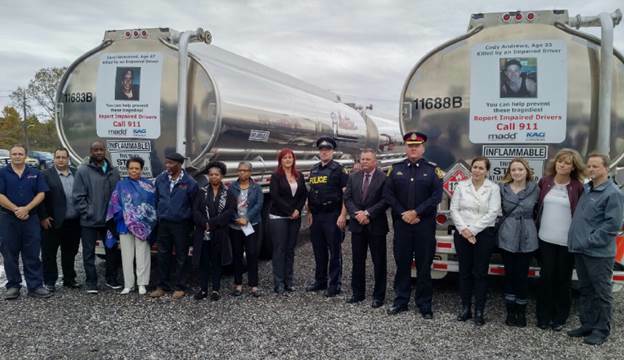 The program will see 40 trucks driving across Ontario roads equipped with a picture of Carol and another young man who was also a victim of impaired driving, along with a plea to call 911 if anyone suspects someone is driving impaired. The Grimmonds were there to help launch this important new campaign and to honour Carol’s memory. 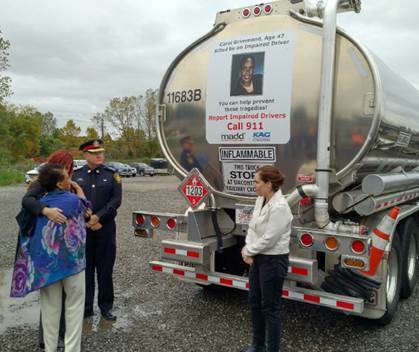 Gladys Grimmond revealed the truck decal with a photo of her daughter along with the accompanying message: “Carol Grimmond, Age 47 Killed by an Impaired Driver – You can help prevent these tragedies! 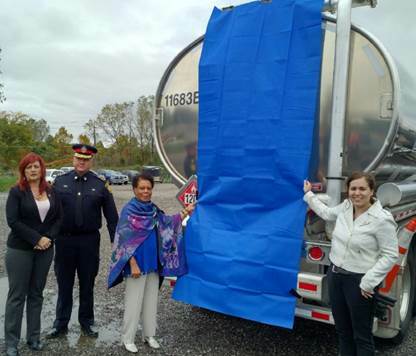 Report Impaired Drivers – Call 911”. After the unveiling Carol’s mother spoke to those gathered about the importance of this message. We are pleased and honoured to share Gladys’ words regarding the launch of this amazing initiative.